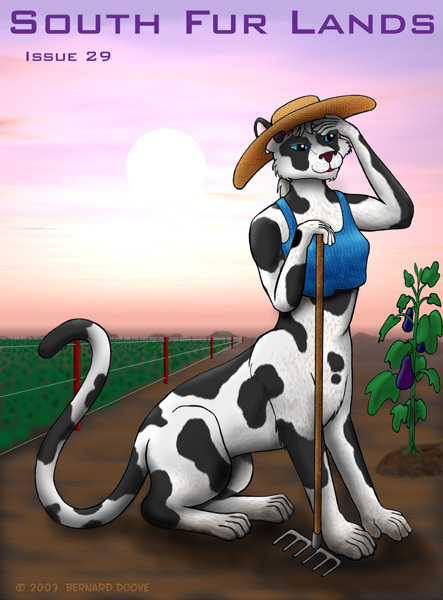 "In The Fields" - Chakat Bluestripe is ready to quit work after a long, hot and dusty day in the farm fields. A beautiful palomino lass dances with the joy of life. Sally poses for the contents page. A scaley and a furry, out for a night on the town. When you have to work in Japan, you also have to deal with typical Japanese problems too. Why? We've got no idea! The troubles that you have when dealing with triplet fox kits! Part 2 of the story of the rebirth of Yuira. Bunny design for the OzFurry T-shirt. Tiger design for the OzFurry T-shirt. A cool and laidback individual. Parts 2 & 3 of the Otherside Of The World series. Character pics from the Furbidden Realms. A tale told in two time periods. Longstocking dances at a luau. A wemic twists around even while at full gallop. Bust of a impressive minotaur. A rubber ducky runs amok! Fox design for the OzFurry T-shirt. The People's Furry leans casually up against the page. Red Shetland relates a story of an unusual defeat. An update on the graphic novel. Super Collie pays tribute to the soldiers of the ANZAC corps. This webpage last updated Tuesday 1st July 2003. Page design by Silverblue.